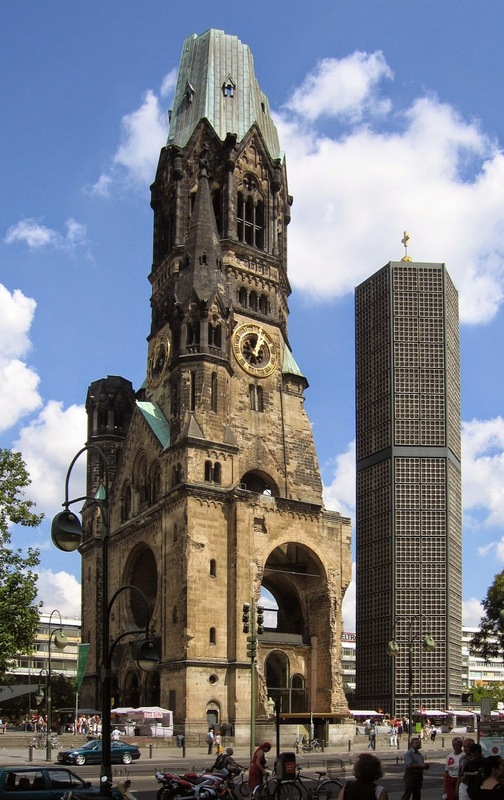 On a main thoroughfare in Berlin, Germany, there stands the Kaiser Wilhelm Memorial Church (or as the Germans know it, Kaiser-Wilhelm-Gedaechtniskirche). The structure in its Romanesque style was constructed in the 1890s and seated over 2,000 parishioners during its original incarnation. Its spire reached 371 feet (113 meters) into the air and was a fine example of architecture of its day, welcoming worshipers for the next 50 years. As it stands today, however, it is a mere shell of its former self, though not to be mourned. I thought of this church again while having dinner with a friend earlier this week. We don't get to spend too much time together but on the odd occasion where we share dinner, she is sure to give me a laugh while our conversations move through a myriad of topics. We spoke about some difficult times we had each endured, times that had thankfully passed, when she surprised me with a question regarding my choice to endure the difficulty until it improved. "Why did you stay?" she asked. I was taken aback by the question, not because I did not have a answer but because no one had asked before. The situation I endured was not hidden, and I had commiserated with a few friends on the issue, and yet not one other person had asked me why I stayed. Why didn't I cut and run? Why did I chose to stay in a situation that was so difficult for me? years. It is a story I do not tell often, and in fact, she is only the second person who has heard the entire thing, as I tend to give an abbreviated version when the subject arises. But she got the whole thing, right down to the messy parts that made me feel as vulnerable as I could ever feel. And she listened. She didn't judge me, and she let me speak my truth. I knew it would be alright because over the years of our friendship, trust was built. I knew it would be safe with her. I also knew I was a far cry from the person I was so long ago, that part of me that became a beacon for any other difficulties in my life. You know the one. You have a beacon like that too -- the one that reminds us, "Things may be bad, but they can't be that bad again." On the night of November 23, 1943, the Kaiser Wilhelm Church was severely damaged in a bombing raid during World War II. The church as destroyed but some of the spire remained. Some years later, the bombed-out shell was marked for demolition so a new church could be built, but the citizens of Berlin said 'no.' They wanted the spire to remain, that scorched and glaring reminder of the worst days, as a testament to where they had been and how new life can be rebuilt. A new church was designed to incorporate the ragged ruins of the old spire while creating new life for a new congregation. In 1984, I saw this church while an exchange student. Even at such a young age, the story of this church struck me as beautiful, and its tale has remained with me all these years. New life and new buildings have been constructed around the site, and the bustle of activity buzzes and whirs around it on the Kurfuerstendamm (a.k.a Ku'damm). Yet, anyone can look up and see the fragment of the past from which one can mark both time and progress, thinking, "Things may be bad, but they [hopefully] will not be that bad again." As the steps get further and further away from that which forged us, the methodical marking of time and progress from then until now only makes the now sweeter. It shapes us, but should not control us. Only when something controls us does it become our master, and the past has a sneaky way of vying for control in so many. I challenge you to stand in your right-here-right-now and recognize some of the messy bits of your past. Keep them in view, not to be guided by them, but to remind you how far you have come.